What is a Pink Pyramid Scheme? I just wrote a review on the Mary Kay opportunity and the term Pink Pyramid Scheme has generated a lot of interest and questions…. 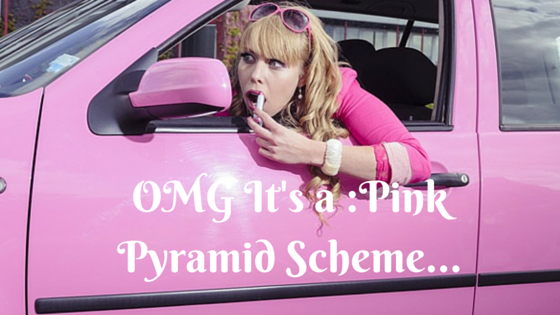 So what is a Pink Pyramid Scheme? This term came into being in 2012 when Harpers published an article about Mary Kay and called them a Pink Pyramid Scheme.So yes maybe one woman will be driving that Pink Cadillac of success but what about all the others? The claim here by Harpers is how Mary Kay preys on housewives and sells them a dream. This dream is that you can be anything you want, just do it. I try and be objective when I share about opportunities and different ways to earn money on my website and the idea behind Mary Kay is really nice. I’m all for the dream too! The Mary Kay opportunity is really motivational and is all about empowering women. This is the type of thing I personally love. I believe we as women can do anything we set our minds to, we should believe in ourselves and reach for the sky… or as Mary Kay Ash says in her video shoot for the moon and if you don’t make it you will still be among the stars. So what is the problem with this? I have a dream too. I want to be a madly successful business woman, I would like my nails to be all pretty and pink all the time (no broken nails) and my hair all perfect. I want to find the perfect balance between work and my family. I want us to go away on holiday regularly and I want a great life. Can Mary Kay provide this? Can Mary Kay live up to its promise? Well I don’t think so, certainly not for the majority of women that join up. Not everyone can do multi level marketing and I just can’t find the time to shave my legs, never mind paint my nails pink. Here is a video that for me gives a better dose of reality, what it is like for most women. Getting involved with multi level marketing companies is not glamorous, it is hard work and the fact is that most people are just not cut out for it. Well done to Mary Kay Ash for making something for herself. I think what she has personally achieved is wonderful but what about all the other women, not just the few that are making money at the top? Not everyone is a Mary Kay Ash, not all women (or even half) that try this out will succeed in it. Most women are like the lady in the video shared above. We have limited time for ourselves and for our family. If we put all our energies into trying to make money with Mary Kay it will actually have a negative effect on our family. I’m not sure about any other moms out there, but I work for myself and I find balancing everything very trying. I can just imagine trying to sell Mary Kay (or any other MLM) products on top of what I do, or in place of it. I am limited to their products and marketing materials. I will have to recruit as well as sell. I will have to take time for their meetings. I will have to make sure I look impeccably groomed all the time as that is part of the pink bit right? Well see I work from home and what I love most about that is being comfortable, wearing pink high heels and make up all day is NOT comfortable, it is not me. This is of course my personal opinion, so feel free to share yours. I see a normal housewife having to tarty herself up, rushing around town pushing bad quality products onto friends and family and trying to sell the dream to all the women she comes into contact with. It just comes across as sad and desperate to me. The thing is that Mary Kay as been nicknamed the pink pyramid but this is how I see most multi level marketing opportunities. They sell a dream, they recruit people that want the dream… most people don’t get to achieve their dreams like this. They end up paying in, losing friends and feeling like a failure. If you are a woman and want to find success you can do it, why not? Why not try your hand at blogging and affiliate marketing instead? Mary Kay – the Pink Pyramid Scheme? Traffic Monsoon Review – Charles Scoville at it Again? This is great article and a good reality check for women to consider EVERYTHING before they jump into any MLM opportunity – there’s a lot more than Mary Kay on the go! I enjoyed the video and it was nice to see someone being so honest about the pitfalls. Funnily enough I came across the term “Pink Pyramid Scheme” on twitter this morning and it caught my eye – now I’m reading this article. I am also a Mum and work from home, as well as part time employment away from home. You made me laugh about the shaving legs thing – I almost have to put it in my diary to get it done! Anyway, great article. LOL Mara, my husband begs me to shave sometimes… oh dear maybe that is too much info? There are loads of mlm’s targeted at women I would consider a pink pyramid scheme too… what about Jeunesse for example? I agree with you here Lynne in that this scheme is not for every woman. With everything that’s advertised seemingly too good to be true, it may not be worth doing for some who wouldn’t be up to the work load required. I have looked into MLMs before and there definitely are some merits. Provided you know exactly what to do and have a good plan. Yes some people are made for MLM… they know exactly how to work it and they have no issues with the way the marketing is done. Does actually exist a MLM that makes everybody rich? I don’t think so, Although i believe that is in each person the last decision to take in order to succeed. If a MLM is legit then it is only the hard work and passion on the person to grow in all the fields. This pink lady sound interesting, i wonder what her story, i will check it out. I agree with you that some people can make MLM work, however it is not portrayed honestly and that I have a big gripe with. They sell you that YOU can do it and easily… well no not really! If you ask me whether one of the opportunities I give a positive review on is “easy” my answer is no, nothing comes easily. It takes hard work and dedication to start a business. I think laying out the pros and cons for each type of business is really important. Hi! I found your article interesting! You see, I was a Mary Kay consultant for about 3 years when I was in my early 20’s. I absolutely loved the products, and that seems to be the reason I get involved in these MLM’s. But you are right, most women, including myself, are no good at selling products, and then having to recruit under you to make the extra bucks. One thing you did not mention in these schemes is that you are required to place a monthly order, which 35 years ago was around $300 a month. Most barely break even, let alone make their millions. And very few get the pink cadillac! Only those at the very top that have 4,5 or 6 downlines make that kind of money. Another one of these you did not mention is Creative Memories. I also was a consultant there for 8 years, and the monthly orders almost destroyed my family. I am a slow learner, but I have finally learned and stay away from anything like this! Thanks, I wasn’t aware of the crazy minimum sales amounts every month so that is nice to know. I’ve never heard of Creative Memories… maybe another company I should review! Hi Lynne, I thought I would throw in my two cents and comment about MLM. I think many people who are thinking about or are in an MLM business don’t realize what the MLM business model is. Companies choose the MLM model because they want to move some of the admin costs and recruiting/marketing costs to the distributors/affiliates/independent business owners. People who do well with MLM are those that can build effective sales teams and then lead them. Unfortunately, most people joining an MLM business are not trained sales, recruiting, leadership and the admin necessary to run an effective sales organization. It is extremely hard work. And, therefore, should pay well. The other problem is it is difficult to recruit a sales force if the message being promoted says it is hard work and takes a long time. (The honesty and integrity issue). Yes of course it is harder to make sales when you are honest about saying it is hard work and of course if you throw in and say actually most people don’t make money in MLM they actually lose and often a lot of money… then everyone would be running away in fear. However most of these MLM schemes tell people that you can easily make loads of money and that it is an amazing opportunity. I do agree that some people make money with MLM but those are really the minority and the rest fail dismally. For me personally I don’t MLM because of the way that they train you to market. I much prefer affiliate marketing.